Price Break For Cervical Cancer Shots In Developing World : Shots - Health News The two makers of HPV vaccines have agreed to lower the prices for their vaccines to less than $5 a shot for low-income countries. The cheaper vaccine may make it easier to vaccinate girls in places where the risk of death from cervical cancer is greatest. 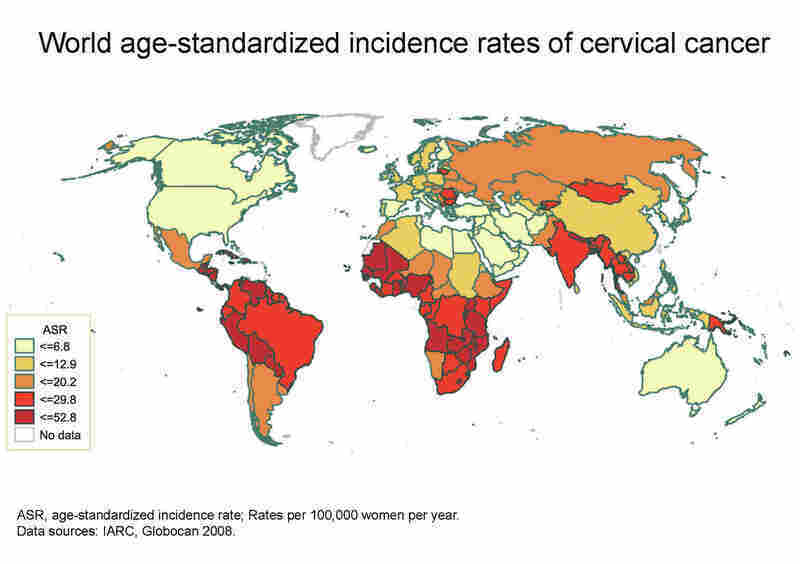 Cervical cancer takes its greatest toll in the countries whose economies and health systems are poorest. Women in those places are less likely than those in rich countries to get regular Pap tests to detect the cancers when it can be treated effectively. Of the 275,000 women who die of cervical cancer each year, more than 85 percent, or at least 234,000, are in low-income countries. But a vaccine that can prevent cervical cancer could go a long way toward lowering the risk in those less developed countries. Problem is, the shots are pretty expensive. In the U.S., vaccines against human papillomavirus cost the Centers for Disease Control and Prevention $100 or more per shot. Private buyers in the U.S. pay even more. Three doses are recommended. Now, Merck and GlaxoSmithKline, makers of the HPV vaccines Gardasil and Cervarix, respectively, have agreed to lower the prices for their vaccines to less than $5 a shot. Until now, the best price available to public sector buyers was $13, according to the GAVI Alliance, which brokered the deal. "By 2020 we hope to reach more than 30 million girls in more than 40 countries," Dr. Seth Berkley, CEO of the GAVI Alliance, said in a statement. "This is a transformational moment for the health of women and girls across the world. We thank the manufacturers for working with us to help make this happen." Some thought the discount should be even deeper. "We think that there could have been a better deal struck for HPV vaccines for these countries," said Doctors Without Borders' Kate Elder, a vaccine policy advisor for the group, according to the Voice of America. "We know that pharmaceutical companies will still be making a very healthy profit off of these vaccines. They have already long recuperated their initial R&D investments. And so why is additional profit being made off the back of the poorest countries?" The cheaper HPV vaccines will be made available in Kenya first, then Ghana, Lao PDR, Madagascar, Malawi, Niger, Sierra Leone and the United Republic of Tanzania, GAVI said.